On a recent visit to London I had a chance to spend some time discovering a fabulous wool shop in Islington called ‘Loop’. A small boutique full of absolutely amazing natural yarns. All hand dyed and sold only in skeins the wools are sourced from small independent wool manufacturers from around the world. The most extensive collection of books to do with wool, knitting, spinning can be found upstairs as well as more colourful and delicate yarns. For a similar boutique in Dublin ‘This is Knit’ is the place to go. The yarns I got come from Peru, Canada and Uruguay and they are made of alpaca, Merino wool and cashmere. The alpaca is extremely light, soft to the touch, silky and warm. It is a fine, durable and hypoallergenic fibre, which is also naturally water-repellent. This yarn is naturally silvery rose. 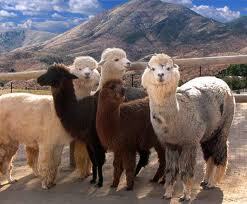 The Alpacas originate from South America and their fleece comes in twenty-two natural shades! One of the merino wool yarns is hand-dyed in bright shades of greens , yellowy-orange and hazelnut tones. Another one is kettle-dyed and varies in tone from rusty oranges to reddish pinks and lime green. One other hand-dyed yarn is a fine mix of merino wool and cashmere with shades of blues, purples, greens, yellows and pinks. Merino wool comes mainly from Australia and New Zeland. It is a fine fibre that retains heat and absorbs moisture, so it is ideal for hats and scarves that you can wear outdoors when the weather is not the best. Cashmere is a strong, warm, light and soft fibre which is extremely fine in texture. A cashmere goat can produce an average 150gr of wool per year. Cashmere occurs naturally in greys, browns and whites. Mongolia is the second largest producer of Cashmere wool after China. Another great encounter over the weekend was with textile designer Claire-Anne O’Brien who was kind enough to meet me at her studio. I was eager to see one of her wool stools again, having first seen it briefly at the Future Makers stand at the Interior Design and Art Fair in Dublin in May 2011. I was utterly blown away by her quirky use of wool. Her pieces are works of art. I particularly like the simple yet intricate patterns she uses to create unusual organic furniture items. My favorite piece is a cream round stool, with doughnut-shapes across the seat linked together in their centre by a thick wooly string. Claire-Anne hand or machine knits all her pieces and has a team of knitters in the UK. She is keen to have some knitters in Ireland and will soon source her wool from here also. Work by Claire-Anne is available exclusively at Makers and Brothers in Dublin.